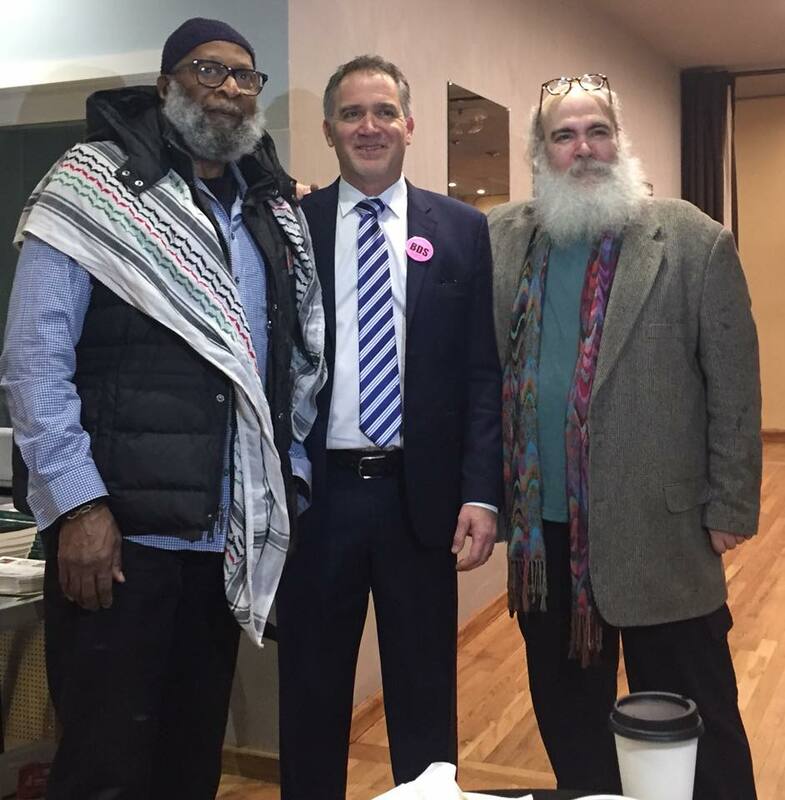 Author/activist Miko Peled took the story of the “Holy Land Foundation Five” to two great gatherings in New Jersey and New York last weekend, as part of a speaker series project sponsored by Just World Ed. 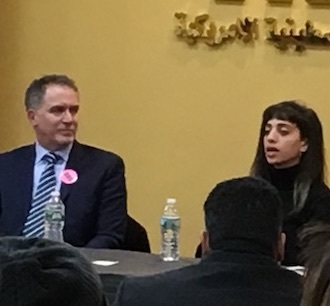 The first event was a Saturday-evening gathering at the rapidly growing Palestinian American Community Center (PACC) in Clifton, NJ, which was co-sponsored by the Center for Constitutional Rights. PACC’s volunteers scrambled to set out enough chairs for the 80-plus people who attended, who included several members of two NJ chapters of Jewish Voice for Peace, as well activists from other peace organizations. The second was a Sunday-evening gathering at the great Brooklyn Commons space in downtown Brooklyn, that was co-sponsored by War Resisters International. The weather outside was harsh, but three dozen attendees representing seven or eight great NYC-based community organizations braved the freezing rain to come to Brooklyn Commons and participate in another very informative event there. 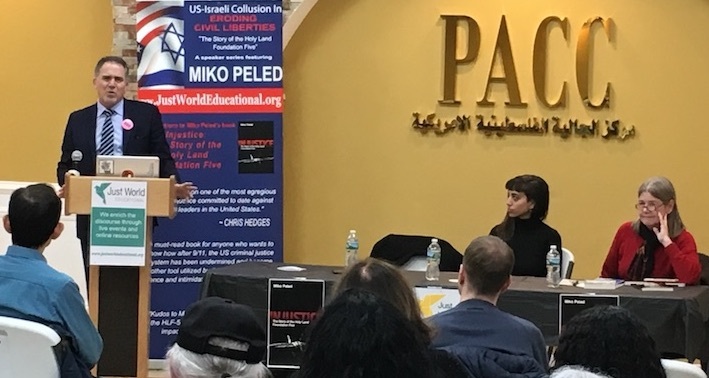 At the PACC event, Mr. Peled was joined at the front table (pictured above) by JWE President Helena Cobban (right) and by Ms. Noor Elashi (center.) Ms. Elashi is a storyteller, humanist, writer, and advocate for conscious living whose father, Ghassan Elashi, is one of the five Palestinian-American charitable-aid leaders who were targeted by the US government after 9/11 and sentenced in 2008 to lengthy terms in jail. We were delighted once again to be partnering with PACC, a lively hub for northern NJ’s Palestinian community. Ms. Elashi made a brief prefatory presentation in which she spoke movingly about the inspiration her family has taken from her father’s activities– and the extreme frustration that several family members recently felt when, after making the long and expensive trek to the distant federal prison where he is held, they were told they would not be allowed to proceed with their long-anticipated visit with him. 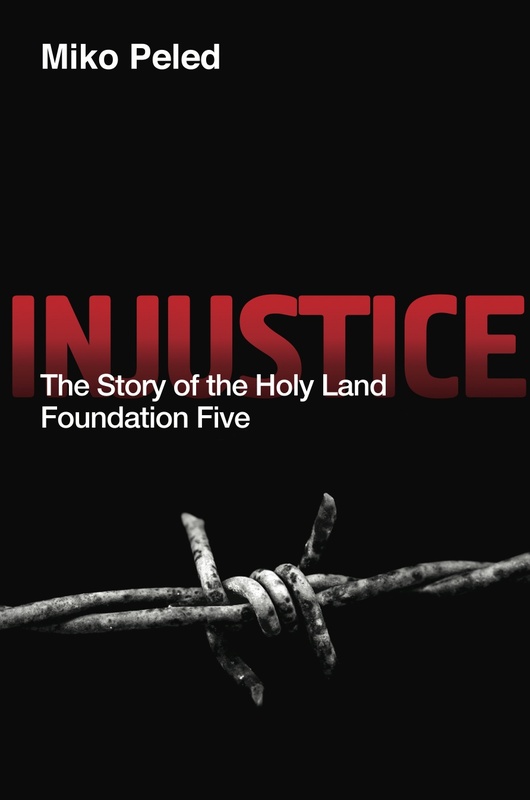 For his part, Mr. Peled is a prominent and courageous Israeli-American advocate for Palestinian rights whose new book Injustice: The Story of the Holy Land Foundation Five is hitting bookstores just about now. To research the book, Mr. Peled spent many months interviewing the five men’s family members and lawyers, and even visiting and interviewing the men themselves, inside the prisons where they are held. He also pored over many thousands of pages of trial transcripts. When he spoke, Mr. Peled described how, before the HLF was shut down by the government in December 2001, it had been the biggest and most widely respected Muslim charity in the United States, much respected for its charity and disaster-relief work both in the USA and overseas. But after 9/11, Pres. Bush had felt compelled to “do something” to demonstrate how tough he was against terrorism– and shutting down the HLF was one of these actions. “How can they connect charity work with terrorism?” Peled mused. He then sketched out some of the story he tells in his book, of how the prosecutors built their case on the theory that by providing some support for the children of Palestinian “martyrs”, the HLF was somehow incentivizing Palestinian men to become suicide bombers. However, he noted drily, this entire argument was based on a misinterpretation of the word shahid, which is the Arabic for “martyr” or “witness” and is commonly used for anyone who is killed during times of conflict in Palestine, not just actual Palestinian militants. Whereas, on the other side of the coin, he argued that the vast majority of the Palestinians who do become suicide bombers are known to be young, childless men. Peled also talked a little about the men themselves and their life-stories. He read powerful excerpts from some of the email exchanges he has had with them while they’ve been in jail, including two notable exchanges with Shukri Abu-Baker. As Peled read these latter excerpts from his book, many people in the audience teared up. 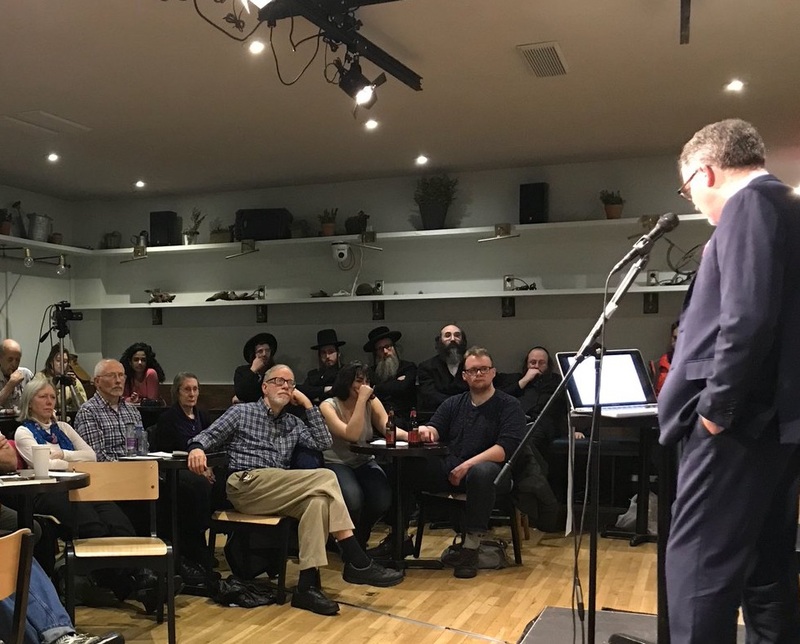 The next evening, Peled took his presentation to the Brooklyn Commons Cafe, where he attracted a wonderful audience including representatives of the Palestinian organizations Al-Awda and Samidoun, of Brooklyn for Peace, Jewish Voice for Peace, Naturei Karta, War Resisters International, and a number of church bodies. In the audience, too, was Sekou Odinga, a member of the Black Panthers Party who two years ago was released after spending 33 years in federal prisons. In Brooklyn, Peled once again demonstrated how the federal government had used “creativity” to conflate charitable work with terrorism, noting that “In America post-9/11, if you’re Palestinian or Muslim you’re guilty until proven innocent.” He speculated that the Bush administration had decided to move against the Holy Land Foundation after a late-2001 visit to Washington by Israeli PM Ariel Sharon. And he noted that in both the federal trials against the HLF-5, the judges allowed the use of anonymized sources provided by the Israeli “security” services whose testimony could not be effectively challenged by defense lawyers since their very identities were unknown. He talked movingly about the effects of the arrests, the trials, and the men’s lengthy prison terms on their families. During the lively Q&A period, he was asked by one audience member what people could do to help the HLF-5. One strategy he focused on was to join the grassroots campaign to use Boycott, Divestment, and Sanctions to build support for Palestinian rights and Palestinian liberation. Miko Peled is taking his presentation on the HLF-5 to Saugerties and Delmar, NY, today and tomorrow; to Washington DC on February 15; and to Seattle and Tacoma, WA, on February 19 and 20. Please see the latest details of these events here. Actively soliciting feedback from event attendees is just one of the ways that we at JWE are working to constantly make our programing better… We would be very grateful for any financial contribution you can make to JWE, that can help make this project and others like it as successful as possible! You will find directions for donating by check, Paypal, or credit card at this page on our website.